Bilfinger Noell GmbH supplied the transport carts CTU and STU for transporting diverse superconducting magnets for the LHC particle accelerator ring of the international research center CERN (Geneva). 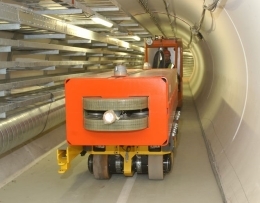 The transport carts feature an optical track guiding system. The transport units CTU and STU each comprise a control and drive carriage at the front and the end, with the carrier plate for the magnet featuring transport, hoisting, and unloading gear in between. 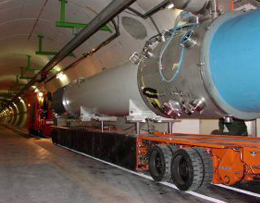 Furthermore, Bilfinger Noell GmbH also supplied transport carts with optical track guiding systems for transporting various superconducting magnets designed for the LHC particle accelerator ring of the international research center CERN (Geneva). The transport units can feature one to four boogies and a control unit which can be positioned anywhere in the transport unit. The boogies transport various magnets in the tunnel and are capable of positioning the magnets between the magnet supports.